After a series of Moto X+1 leaks it looks like we may finally have our first good look at Motorola's next flagship smartphone. 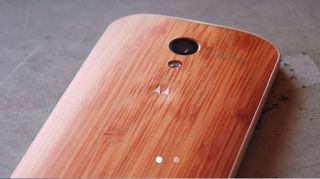 Newly leaked images sent to Android Police show a purported "near-final prototype" device from Motorola. Judging from previous leaks the phone's dual speakers and custom wooden back strongly suggest this could be the Moto X successor. From the front we can see the original Moto X's substantial chin has been shaved down. It seems the Moto X+1 will also do away with any capacitive touch buttons. Around the rim it appears the Moto X+1 will be fitted with a metal edge to complement the phone's mostly plastic build, similar to the Samsung Galaxy S5. What would you Moto make? Around the rear there's a wooden back with two holes for a plastic Motorola logo and the camera. The camera is situated in the center again, but it looks as though the dual-bulb flash has been moved to the sides of the lens – this would explain why there was no separate cut out for the flash on the leaked bumper case for the handset. Along with the wooden back the same source who leaked the images claims the handset will come in other shades of plastic including black and white as well as custom leather finishes in blue and purple. One thing the leaker didn't mention was whether the device will also sport a Kevlar-patterned back inherited from the Droid Ultra Maxx. Other rumors suggest the Moto X+1 will sport bumped up specs in every respect starting with a new 5.2-inch, 1920 x 1080 resolution screen. The phone could also have a faster Snapdragon 800 processor. 2GB of RAM, and 24GB of storage. A higher spec 64GB model has also been rumored to come with a microSD card slot not found on the regular model. Camera-wise the Moto X+1 said is to feature a 12MP rear sensor coupled with a 5MP front snapper. How will the Moto 360 integrate with Motorola's new smartphone?